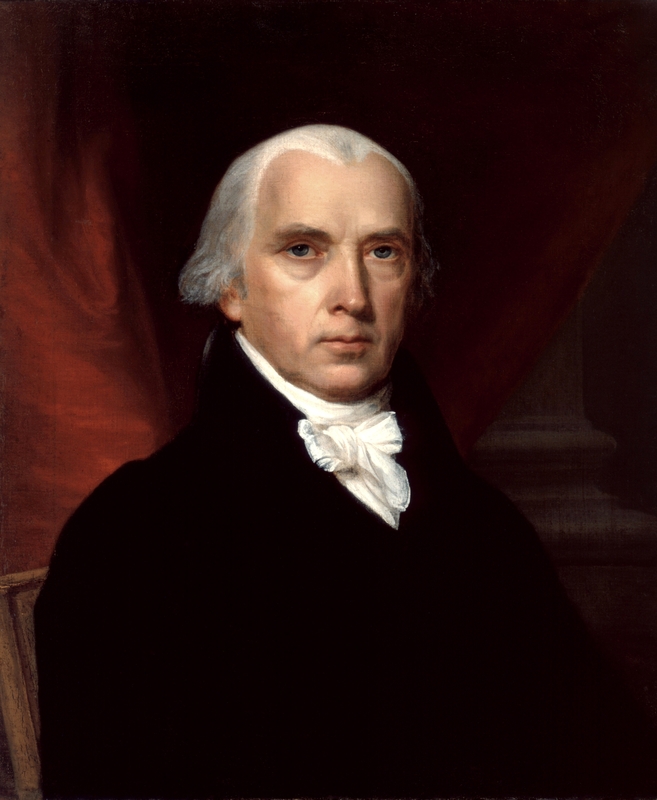 Portrait of James Madison, one of the authors of the Federalist Papers, and the fourth President of the United States Medium/Support: oil on canvas Measurements: 26 x 22 3/16 in (66 x 56.4 cm) Scholar’s Notes: «The portrait [of James Madison] was commissioned . . . by James Monroe . . . . Cameo-like, with firm planes and carefully controlled range of values, it does not rely on deep shadow or strong contrast for its sculptural effect, but works mostly in light tones. The face, despite its impassivity, reveals the toll exacted by the War of 1812 . . . . It is set above a high-collared black coat between a freely painted cravat and the simple powdered hairstyle favored by Madison . . .» Source of Scholar’s Notes: Kloss, William, et al. Art in the White House: A Nation’s Pride. Washington, D.C.: The White House Historical Association, 2008.